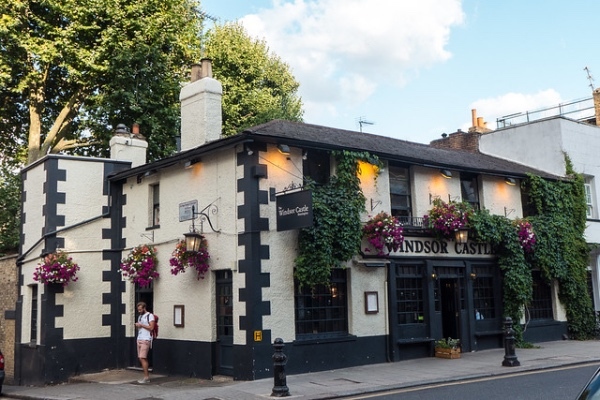 The story goes that this Kensington pub – which sits on the brow of Campden Hill – was given its name because on a clear day it was possible to see the crenellated towers and walls of that royal residence from the windows on the upper floor. Whether or not that’s the case remains a matter of some speculation – perhaps the pub was simply named after the salubrious royal abode for its cachet. The Grade II-listed pub, at 114 Campden Hill Road just to the east of Holland Park, dates from the 1820s when customers apparently included farmers taking their livestock to Hyde Park for market day. It is said to have been remodelled in the 1930s but, according to its listed building entry “retains a substantial proportion original fabric” as well as, given the remodelling, “exemplifying the ‘Old English’ phase of inter-war pub design”. The original features of the pub, which also has a walled garden, include wooden screens which separate what were the original bars – Campden, Private and Sherry (the name of the latter apparently comes from a drink once served here called the Hunter). The screens are fitted with small doors, the tiny size due to the fact they were originally intended only for use by bar staff. There’s a story that the bones of philosopher and author Thomas Paine – he of Rights of Man fame – are buried in the cellar. The bones of Paine, who had died in America where he’d been one of the Founding Fathers, were apparently shipped back to his birthplace of England by MP and social reformer William Cobbett – he had intended to give them a fitting burial on his native soil but that never took place. Instead, when his son inherited them, he is said to have sold his skeleton to the landlord to settle his tab. Not to be confused with other ‘Windsor Castles’ in London including one in East Finchley and another in Marylebone.